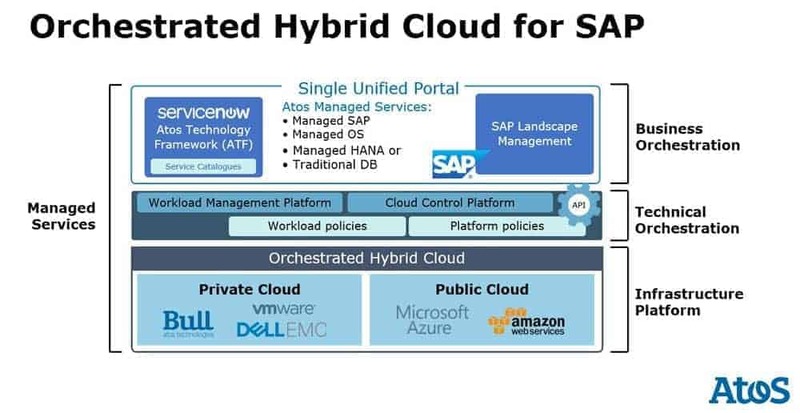 With Gartner predicting that 90 percent of organizations will adopt hybrid infrastructure before 2020, selecting the right cloud partner for SAP is a key business decision. This article is an advertorial payed for and edited by Atos. The article can be downloaded at the bottom of the page. With a wide choice of potential partners, each with varying depths of business and technical skills, organizations face a challenge in identifying the partner best able to help achieve their goals. This does not have to be a highly complicated task. By answering a few simple questions, organisations can quickly reduce the list of potential partners to those that are best able to meet their needs. These can then be further reduced by examining these key areas in more detail. Support for Cloud or Clouds? to utilise services from both providers. A key question to therefore ask providers is their ability to support and integrate both clouds into an orchestrated service, providing choice, but with a consistent service model across these. This ensures that customers have a choice of clouds and are able to leverage specific benefits or services from either without having completely separate provisioning, monitoring and management environments. The Gartner research also recognised that although use of public cloud infrastructure and services continues to gain market share in enterprises, adoption of private cloud also continues to grow (at the expense of traditional infrastructures). A key requirement driving hybrid cloud growth therefore is the ability to benefit from the agility, scale and elasticity of public clouds, without compromising the ability to run workloads and services privately for security, compliance or performance reasons when necessary. 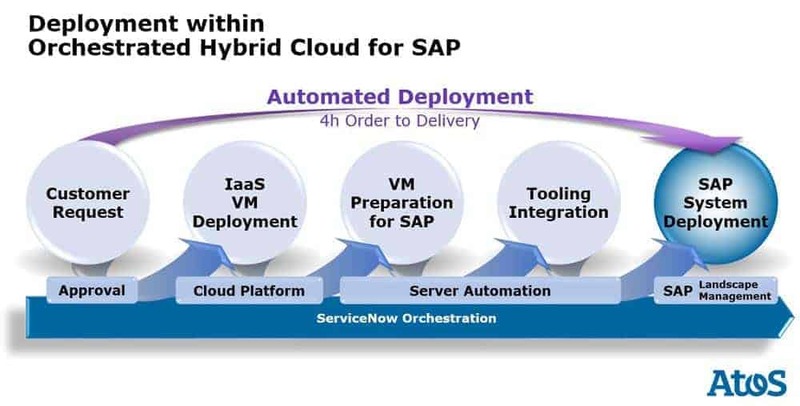 The Orchestrated Hybrid Cloud for SAP. Private Cloud or Performance Private Cloud? Whilst the services available to customers from both Amazon and Microsoft are the same for all customers, the services available to customers from private clouds can vary significantly. This is a critical area for SAP users to investigate more thoroughly when assessing providers. The ability to offer high performance hardware options, support large memory models capable of delivering the optimum performance for SAP HANA, and the ability to support extended or customised functionality are key differentiators. Several suppliers have collaborated closely with hardware providers to develop private cloud platforms specifically designed to run the most demanding SAP workloads. For other workloads, the platform cost is the primary concern, so customers may want to look to providers that offer a choice of hardware platforms and are able to meet demands for cost-effective, secure private clouds as well as high performance options when this is required. Organisations need to assess the demands of their workloads and select partners able to deliver platforms capable of meeting these demands. Atos provides a good example of this through collaboration with its Bull division. Atos developed a private cloud platform that utilises high-performance Bullion™ servers together with all flash storage systems specifically designed to host the most demanding SAP environments. This compliments the existing Atos Digital Private Cloud offering which provides a highly scalable private cloud for a range of workloads, including SAP. Cloud Infrastructure Provider or Managed Services Provider? In additional to providing easily scalable infrastructure and utility-based pricing models, moving to cloud-based services can enable organisations to redesign their business models. Organisations can leverage the experience of cloud providers and partners across operations, service management and security to reduce costs or redeploy in-house IT teams to business-facing or value-added functions. The scope of services can vary significantly between partners, from basic platform or application support through to a comprehensive end-to-end service model able to support all aspects of the service, from technology to business. As the most comprehensive of these service models, a fully managed service model allows customers to benefit from cloud service models without having to manage the challenge of recruitment, training and development in an increasingly competitive jobs market. With the number and complexity of viruses, malware and hacking continuing to increase, managed service customers are able to benefit from specialist skills, tooling and investments made by their partners in security, often in collaboration with government bodies or major customers. Larger providers are able to leverage investments and skills developed to address high-profile customer requirements, embedding this within their standard services. A simple test to help differentiate potential cloud partners for SAP environments is to focus on what additional value they bring to customers. Has the partner invested in developing new capabilities or services that competitors do not offer? Have they understood some of the limitations and challenges of public and hybrid clouds and developed complimentary services to address these, or simplify their use? An example of this would be the ability to provide a choice of clouds when provisioning new services, but with the ability to limit the scale, geographic location or scope of those services so the service remains compliant with IT governance policies. Another example could be cross-cloud workflow and approval support. This allows companies to better control their cloud expenditure, requiring approval for larger deployments or more use of expensive services. Underlying these value-added services should be a recognition that whilst cloud services deliver potential benefits, they also bring new risks. Partner services should ideally aim to simplify the steps to achieving the benefits whilst reducing the exposure to risks. A key area of interest for SAP users should be the integration of SAP services into the platform so the customer sees an end-to-end service, ideally delivered through a single interface with high levels of automation to simplify complex tasks, rather than a collection of portals with each providing a separate or discrete function. Integration of SAP and cloud services into service management tooling is a key point that is often overlooked. If a customer wants the ability to have a private cloud and support for Amazon and Microsoft public clouds, then they should understand whether the partner can provide a single pain of glass, allowing the customer to manage provisioning, monitoring and billing from single tool, rather than a separate tool for each platform. Cloud Navigator or Cloud Pilot? Many companies can help organisations understand the benefits from hybrid clouds, however the list of those that are able to migrate customers and transform their businesses is much smaller. Implementing new services on cloud platforms or showing how cloud adoption can help your business will not maximise the potential benefits available. This can only come from transforming business services and process to take advantage of cloud infrastructure and service models. Often referred to as ‘cloudification’, this process involves the assessment of business processes, applications and services to determine their suitability for the cloud as well the actions needed to maximise the value from them being in the cloud. Whilst some applications can easily be moved from conventional infrastructure to hybrid clouds, others may require redevelopment. Rather than be a problem, this may present an opportunity to redesign the application or service as a cloud native (or born in the cloud) application, able to fully benefit from a cloud-based architecture – to better scale, to offer greater resilience and to offer a high-quality customer experience regardless of where in the world the user is located. Local Player or Global Leader? It is important to match the capabilities of the potential partner to the scale of the customer. For small specialised requirements, a local partner may be sufficient and is likely to have the flexibility to meet specialised requirements. For larger customers, and particularly multi-national customers, it is important to ensure that the partner has the depth and scale of skills necessary to meet the expectations of the customer. The depth of industry expertise may also be a factor to consider. Manufacturers may want to look for partners with expertise in their industry. This is particularly true in areas of emerging technology, where industry knowledge and partnerships are key differentiators in being able to being new services to market. It is a truism to state that cloud is a rapidly changing environment. Amazon Web Services has grown from its launch in 2006 to a business with $12 billion in revenue by April 2017, achieving year-on-year growth (to March 2017) of 43%. Microsoft continues to invest in building new cloud data centres, having more than Amazon and Google combined. The pace of new services and updates of cloud platforms continues to increase every year. Your cloud partner should demonstrate a similar commitment to innovation, continually improving their services and helping customers improve their services. Look to their track record and their participation in industry forums such as SAPPHIRE NOW. A simple list of questions is not sufficient to select a cloud partner, but these questions should help reduce the number of potential partners to a manageable size that you can then start engaging with directly. Gary Burt is Global Product Manager Cloud, Infrastructure and Data Management at Atos.